Even though I gave up gluten years ago, I still would from time to time have gluten-free grain options. In the past several months as I’ve increased my carbohydrate levels, I’ve been consuming popcorn and treats from Dolce Lou (now Nuflours), a local GF bakery. At first I thought I was OK with the gluten-free grain options, but I noticed a red spot on my skin that seemed to become more pronounced the day after I consumed popcorn. A skin inflammation is often a sign that that something is wrong internally. Also when I dug through my headache data, I noticed an uptick in headache intensity on Wednesdays and Sundays, which are the days I am most likely to consume a gluten-free bakery item from the Farmers Market. Time for a new experiment! I am going 100% grain free, including popcorn, for 30 days. White rice is still OK. For some reason, I thought I did this specific test once before, but if I did I don’t have accurate data. Plus it is probably a wise idea to get updated information. Photo by Robyn Lee. 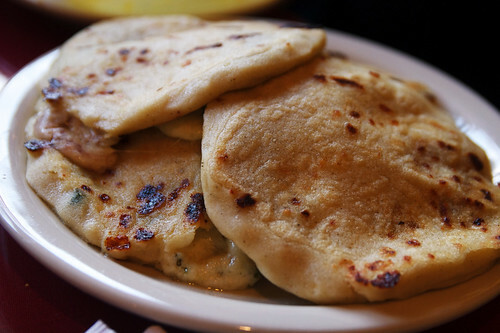 Pupusas from my newly found El Salvador restaurant will have to wait a month. Is anyone else starting or in the middle of a dietary experiment this summer? I am still having my daily fix of 2 cups at least at the moment. Your thoughts? @Pauline – I am not a fan of doing the cold turkey caffeine detox. I think they are ineffective, especially for those of us that take true enjoyment from our beverages. I’ve tracked my coffee intake daily since March 24, 2011. I’ve noticed that when I start averaging 4 units of coffee (1 espresso or a small coffee) then I benefit by cutting back to 3. However, when I drop to 2, my performance suffers, so that drop off requires more planning. When I started learning about brain chemicals (the Tyrosine and 5-HTP posts) is when I got concerned about the serotonin decrease. I was taking a supplement to fix my brain from a problem I created via too much caffeine consumption. I think your comment has inspired me to prepare for a coffee detox in September. How low and how long are still to be determined. I usually eat pretty strictly paleo with the occasional (or slightly more than occasional) chocolate and alcohol thrown in. But I’ve been having hamstring problems for about 4 months now and decided it was time to be really strict for a while. So for July it was no grains, no dairy, no legumes, no alcohol, no sugar. And after a week or so my hamstring felt almost normal for the first time in forever. It really seemed to help. Plus, my stomach is so much happier with no grains or sugar. Good luck. Oh, and while I think popcorn is one of the very best things invented EVER (particularly with butter and brewer’s yeast), not sure it’s very healthy. @Roberta – When I think of muscle or joint injuries, my go to food is bone broth. @Charles – White rice is just glucose. It has none of the anti-nutrient issues other grains do. I am actively working on improving my Asian cooking skills, so I need my rice. Plus my carb levels are higher now than at any other time of the year. It is also easier to find dishes with white rice than sweet potatoes outside the home. I wonder if your issues were related to the root veggies or the broth? I’ve never had those issues. Even if I did, I would consume it as part of an injury recovery protocol. One side benefit of a paleo diet is the elimination of the biggest, stinkiest fart producer—beans (due to the indigestible sugar raffinose)—and several smaller ones (wheat, oats, all grain products). And it sure seems like my gut bacteria have less to do now that my amylase and sucrase supplies aren’t being overwhelmed by an avalanche of starch and sugar. You’re not eating plants: you’re eating BACTERIA POOP. The comments even touch on why fermenting veggies can be better than fresh, because the fermentation takes places outside the gut. As for legumes, my experience with them has been far better when they are properly soaked and sprouted. I was wanting to ask if you have ever had a long break from daily coffee. And if you have read about caffeine an serotonin decrease in the Mood Cure or elsewhere? I would like to know how you progress with a caffeine detox as it is one of those areas I have so many questions about. My partner regularly gives it up an handles the withdrawal and headaches. But always gets back on it at some point. I am personally very drawn to caffeine an the buzz it gives me as well as the social context. @Pauline – In 1996, I went 100 hours without caffeine. In September 2011, I went 13 days without coffee, but I still drank tea. For me the problem is I live in an espresso Nirvana and quality continues to get better and better. It is one thing to fight a caffeine addiction when the stimulus is constant. It is far more difficult when the quality seems to get better every few months. So I have a conflict. I am both deeply interested in my health and espresso quality. Smile. I fully comprehend. Well said. Have you thought about FODMAP diet? If you’ve done well on gluten free diet and are not completely symptom free, you may want to check into it. It may explain some of your symptoms that are still occurring after eating baked goods as they may be gluten free, but still have other FODMAPS in them. Just a thought. @Tammy – I just read the FODMAP page on About.com. I have no IBS symptoms, so it is unlikely this diet is necessary for me. Hello! I’m Anna from Hungary and interested in paleo-eating. What’s the result of your 30 Days Experiment without any grains? Is it better than with gluten-free grains? And why? Your joints for example or what? I have constant constipation, do you think it’s caused by grains? Either gluten-free grains can cause constipation? @Anna – Thanks for reminding me about this experiment. I will post my results in my next blog post. I can’t answer your specific questions. My advice is to run your own experiment. 30 days should answer those questions for you. Thank you, and yes, you’re right. I’ve just read the results from your Great Experiment :), it’s very instructive.